In this mini-expansion, the extra tiles are not placed in the supply, but are placed separate from the others. Your Messenger meeple is placed on the scoreboard with your regular scoring meeple. When you score points, you will have the option of advancing your regular meeple our your Messenger meeple. If either of your meeples falls on a spot that is darker than the others (5,10,15,20…) you will take a Message tile. You will have two options with your message tile: perform the action stated on the message or score 2 points. The actions written on the Messages vary, but they can allow you to score points for roads, cloisters, cities, or even the number of meeples in your supply! 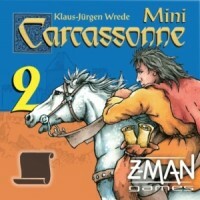 Add a Review for "Carcassonne: Mini-expansion #2 – The Messengers (Second Edition)"